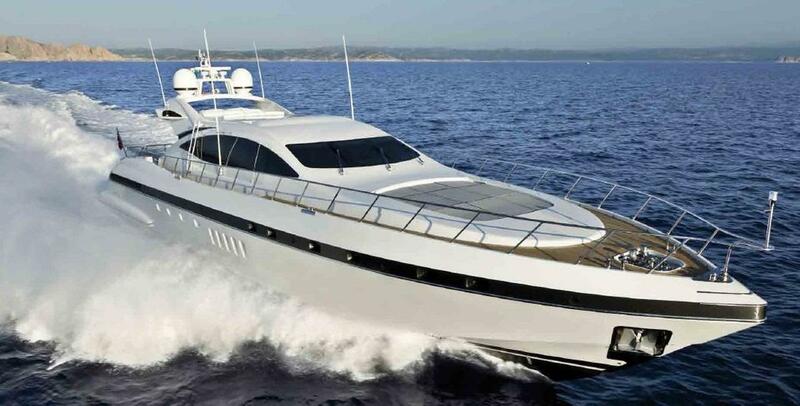 BEAR MARKET is a high performing luxury sport yacht built by the Italian superyacht builder Mangusta (Overmarine) in 2003. 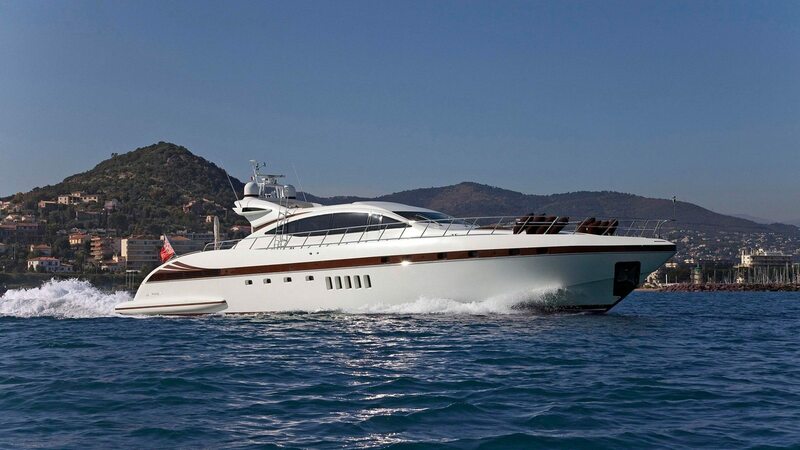 Measuring 28.27 meters (92.7 Feet) in length, she is full of Italian style and boasts a fantastic cruising speed of 25 knots that makes her ideal for fast-paced cruising. 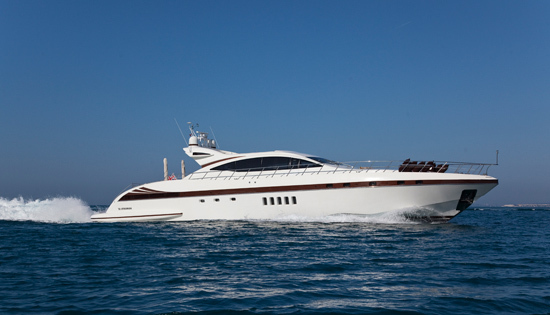 She can accommodate 9 guests in 4 well appointed cabins. 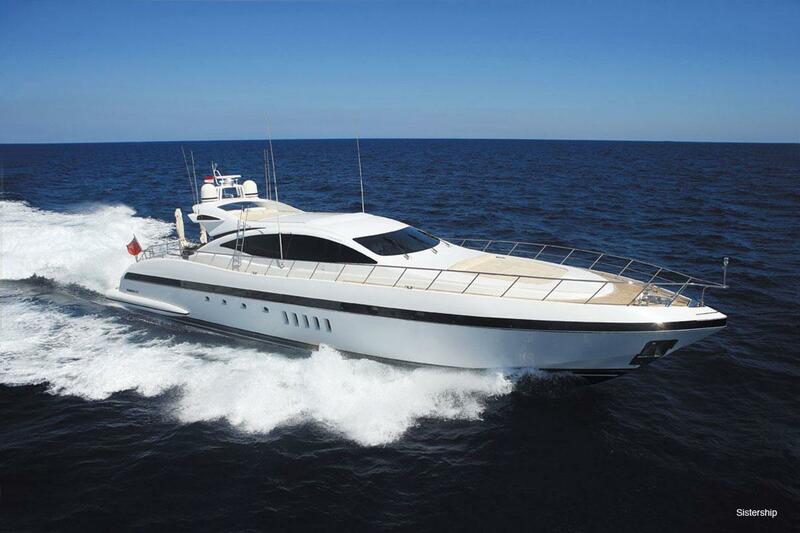 BEAR MARKET is a 28m open-style superyacht featuring a sleek exterior complemented by a warm and comfortable interior. Her interior combines Wenge and Sycamore wood paneling, a dark oak wood flooring and light fabrics. 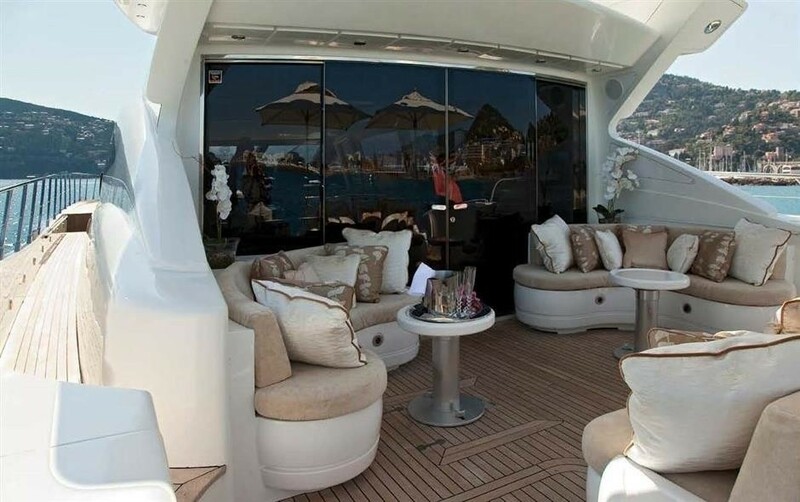 The yachts salon provides a comfortable area both for lounging and dining. 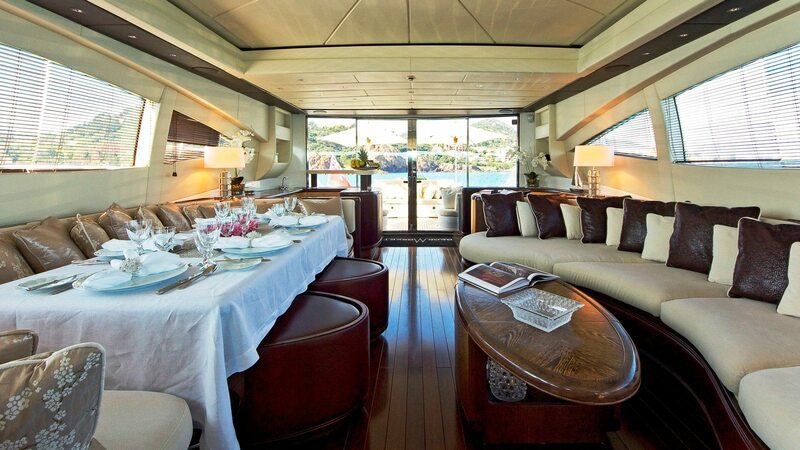 To the port, there is ample seating with a sofa and interior dining for 8 guests on the starboard side. 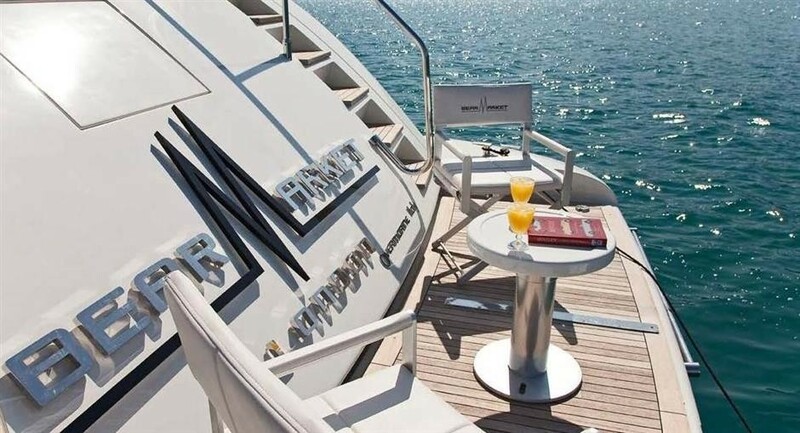 There is also a wet bar with a fridge and an icemaker on the starboard side of the salon. The salon features a 42' Flatscreen HD TV, an iPod docking station, Blue Ray DVD Player and Sky TV. There is also an iPad with a large selection of movies. Forward of the salon is the pilot house with 3 comfortable chairs in dark brown leather. 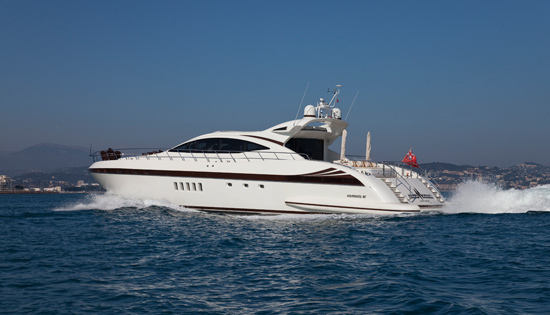 She is well equipped thought-out with 3G Wi-Fi Internet , new HD LED LCD TV's , Sky TV in Salon and in the Master Stateroom, iPod docking stations in the Salon, the Master and VIP cabins and Blue Ray DVD players in salon and all cabins. 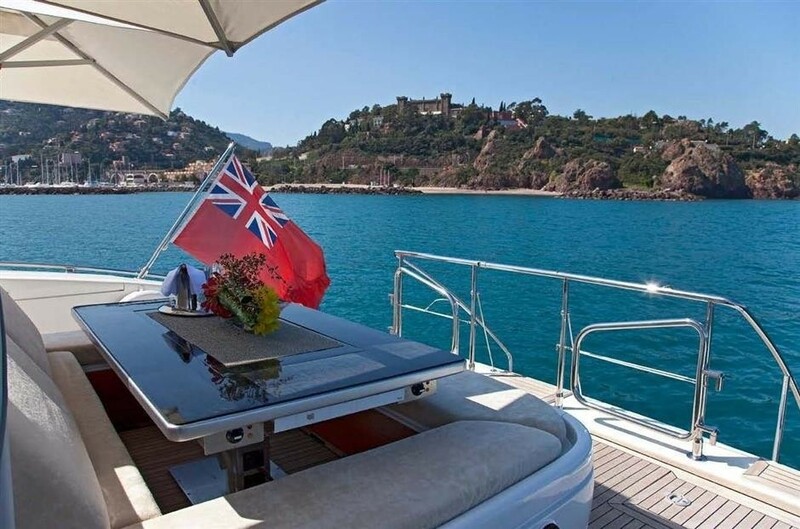 M/Y BEAR MARKET also has great outdoor areas with ample sunbathing spaces with a sun pad on the aft deck, forward and on the roof (only available for adults and when the yacht is at anchor). 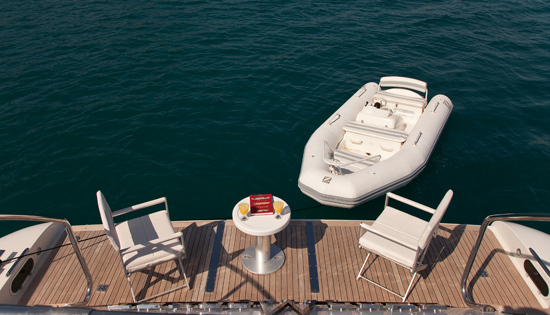 The aft sun pad can be turned into an exterior dining area for 8 guests. The table lifts out of the sun pad, where you can dine in the shade or sun thanks to two large sun umbrellas. 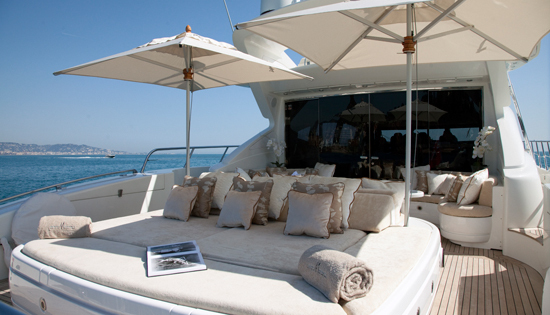 The aft deck also has two sofas, each with a low table for relaxing or sipping cocktails. 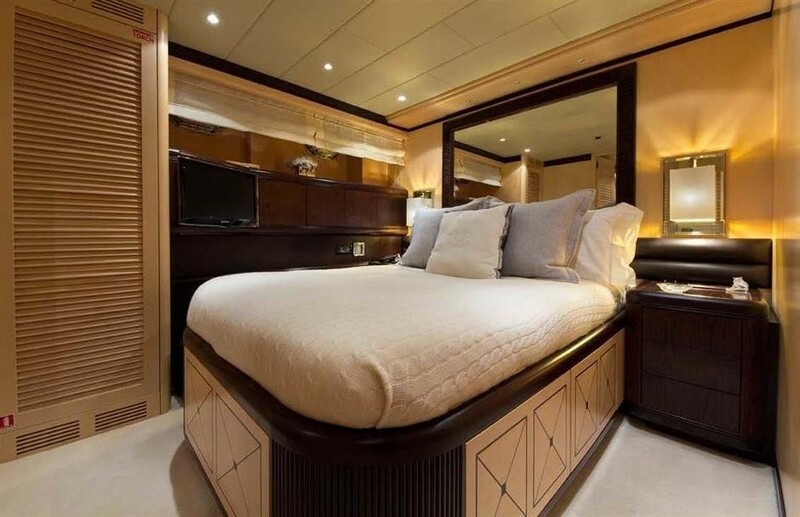 BEAR MARKET is able to accommodate up to 9 guests in four guest cabins located on the lower deck including a Master Stateroom, a VIP, a double and a twin cabin with a pullman bed, all with ensuite facilities. 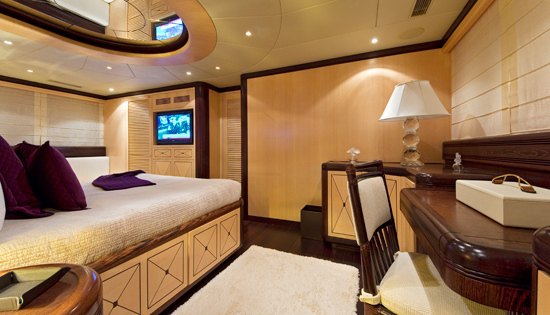 The Master stateroom is situated mid ship with a central King-size double bed. 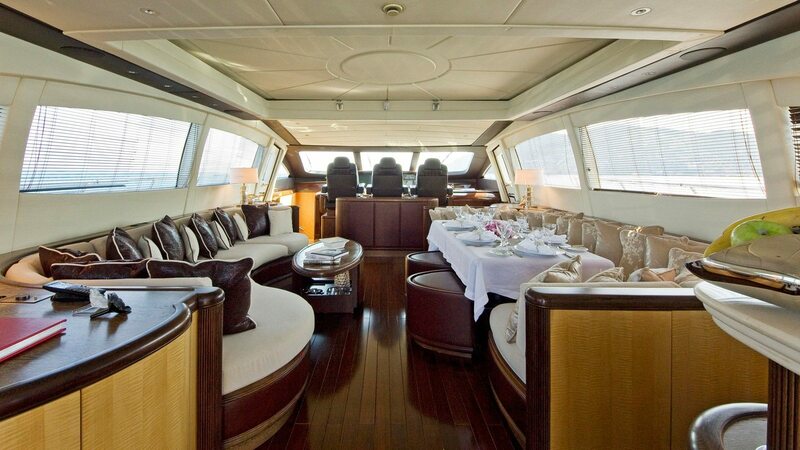 The master cabin boasts large portholes to port and starboard providing plenty of natural light. 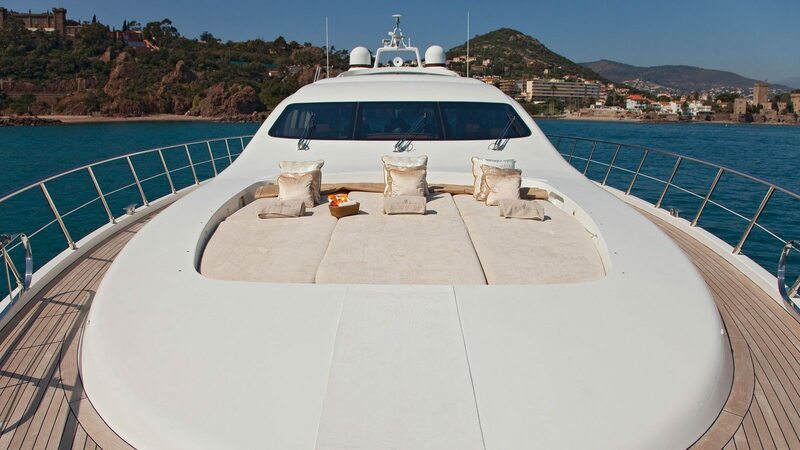 There is a Settee port side and a Vanity to starboard plus a small fridge. There is also a large walk-in closet and an en suite with his & her sinks, a large shower, a head and a bidet and heated towel racks. 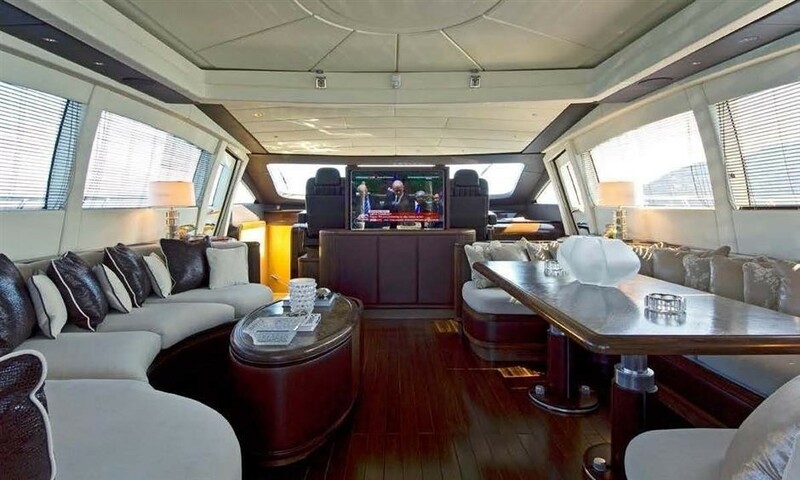 The master cabin has a LG 40' Flatscreen HD TV, Blue Ray DVD, Sky TV and an iPod docking station. The VIP Stateroom is situated forward with a Central Queen-size double bed. 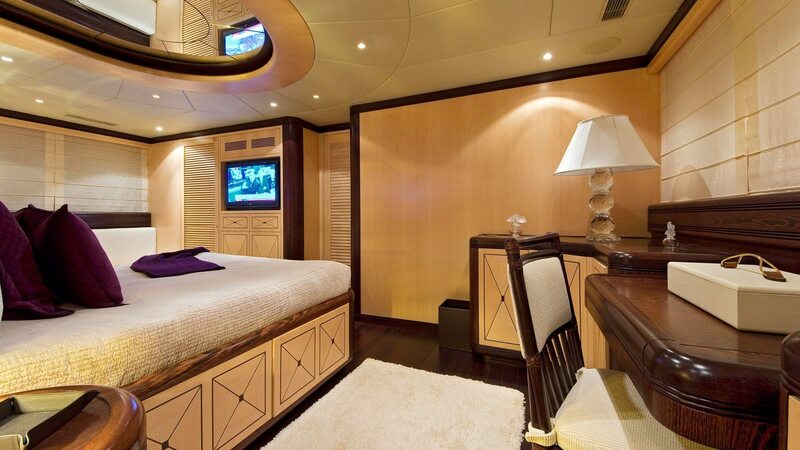 The cabin has a settee on the starboard side and two closets. 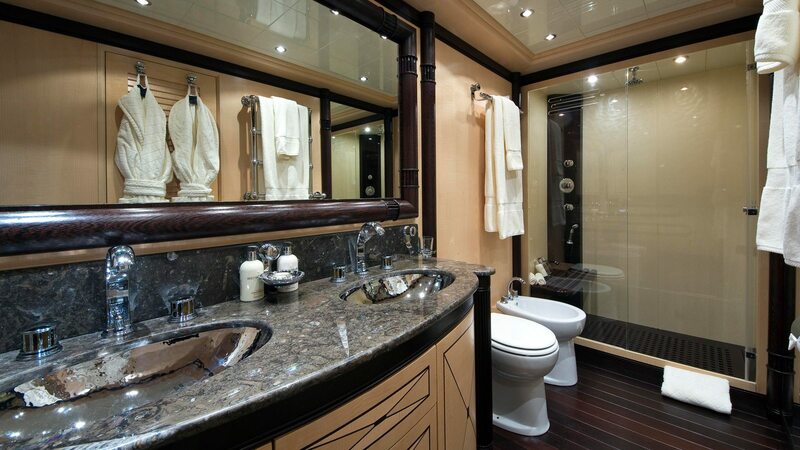 The en suite is equipped with a shower, a zink, a head and heated towel racks. The cabin has an Aquos 40' Flatscreen HD TV, Blue Ray DVD and an iPod docking station. 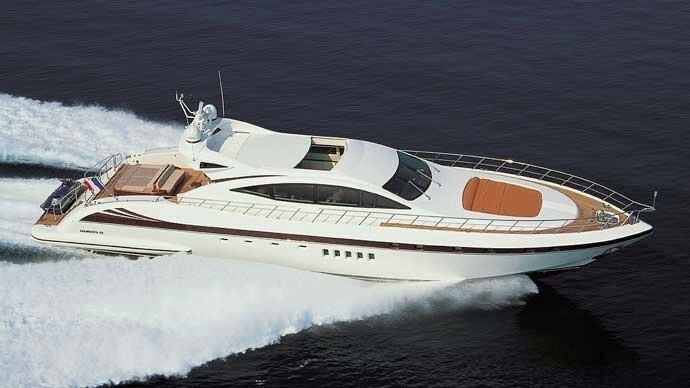 A double cabin is located starboard with a double bed and a closet plus a Samsung 22' Flatscreen HD TV and a Blue Ray DVD player. The en suite has a good size shower, a sink and a head. 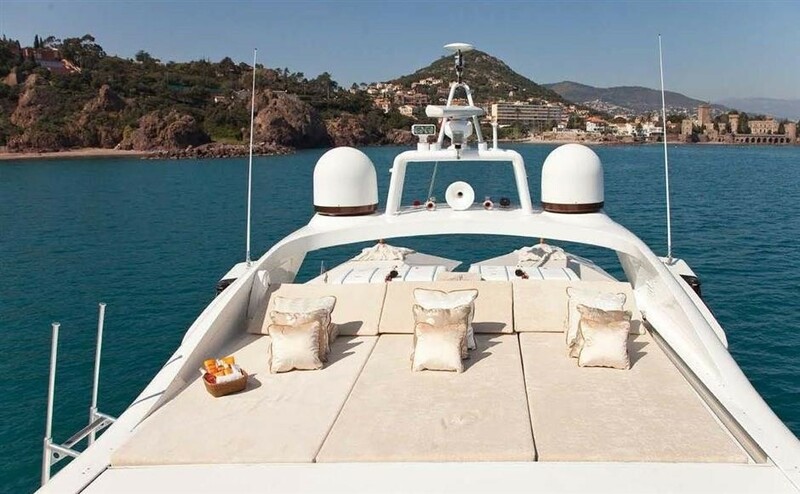 The twin cabin is located on the port side and has two single beds and a pullman bed, a Samsung 22' Flatscreen HD TV and a Blue Ray DVD player. There is a closet and the en suite has a shower, a sink and a head. 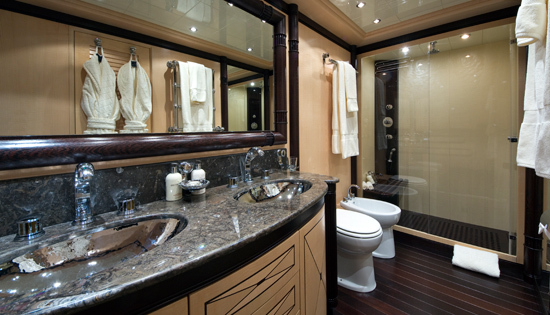 The staterooms onboard the luxury yacht BEAR MARKET are all equipped with Molton Brown products and Ralph Lauren towels and dressing gowns. 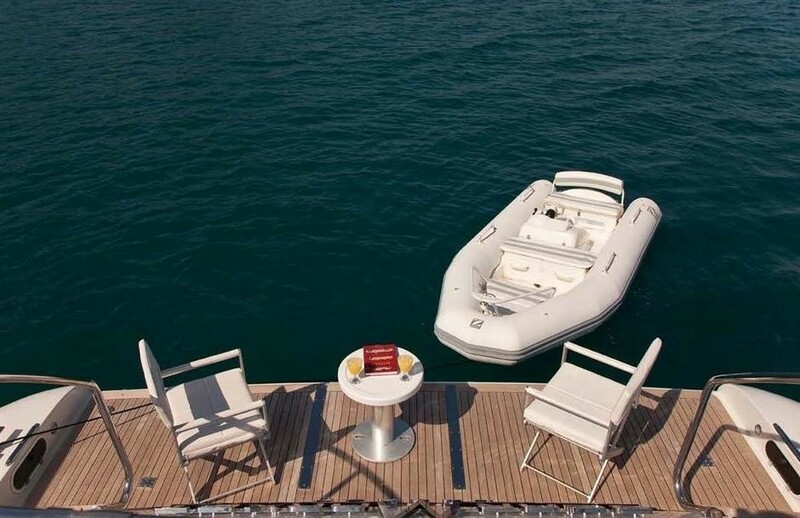 The M/Y BEAR MARKET has the following selection of Tenders & Toys onboard: 2.5m Zodiac 420 Jet tender, Wakeboard, Waterskis, Snorkelling equipment, Inflatable toys. 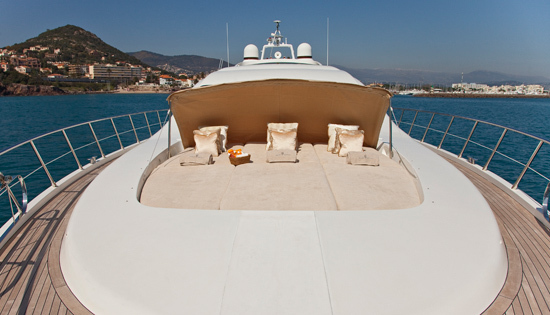 Communications include 3G Wi-Fi Internet Audio Visual Equipment and Deck Facilities include 3G Wi-Fi Internet throughout. There are new HD LED LCD TV's throughout. Sky TV in Salon and in the Master Stateroom. iPod docking stations in the Salon, the Master and VIP cabins. Blue Ray DVD players in salon and all cabins. 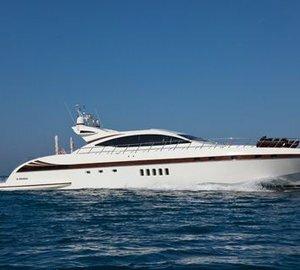 Amanda, you were excellent to work with right from searching for an appropriate charter thru to assisting with all of the arrangements. And the Captain and crew exceeded our expectations. Overall a great trip. 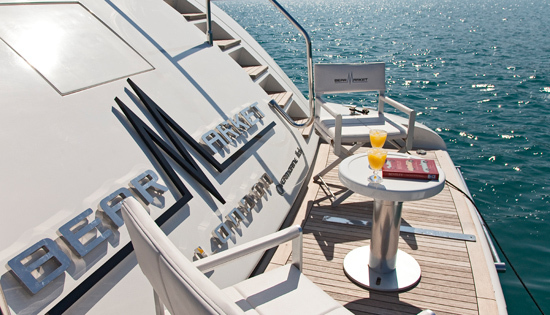 AJ chartered BEAR MARKET in Cannes for the MIP TV.